King Neptune, a beautiful mermaid, oysters and pearls, and bonuses galore: if you started playing Microgaming's underwater adventure slot, Mermaids Millions (note to Microgaming: you missed an apostrophe somewhere), you'd be forgiven for thinking you were playing RTG's aquatic-themed slot, Mermaid Queen, or NextGen's equally lovely Enchanted Mermaid, such are the similarities. In both of those slots, free spins were the standout feature, and so it is with Microgaming's effort. 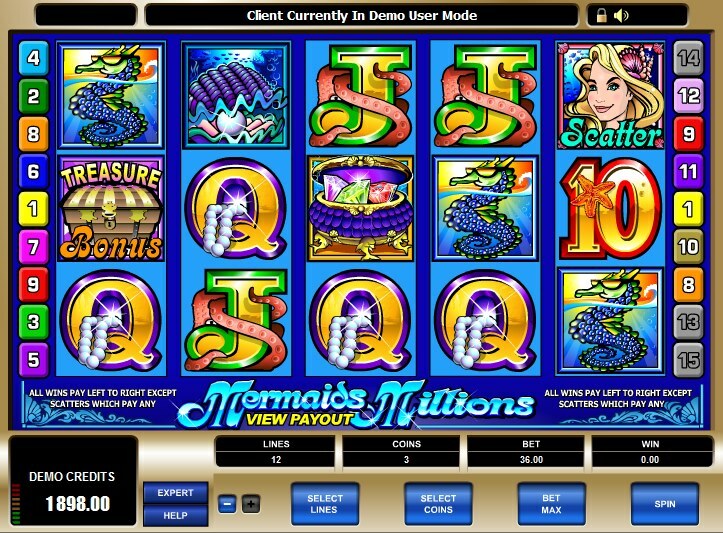 10 free spins are activated when hitting three or more of the beautiful mermaid symbol on the reels. Not only that, but all wins are trebled during the free spins round. Elsewhere on this 5 reel, 15 pay-line slot, we get plenty of symbols putting you firmly in a watery domain: King Neptune, pearl-bearing oysters, treasure chests, funky seahorses, jewellery boxes and the customary 10-through-Ace symbols, here draped in all manner of underwater creatures. King of the Sea is the Wild, and he substitutes for all symbols other than the Scatter and Treasure Chest Bonus. The fishy mermaid is the Scatter. Three or more of her on the reels activates 10 free spins, where all wins are trebled during the round. Finally, a Treasure Chest bonus is activated when three or more chest symbols hit the reels. Another pick-the-box game, you'll journey to the bottom of the ocean to be presented with a series of shells. Pick anything from three to five, depending on how many bonus symbols you originally hit on the reels, and claim your cash prize. 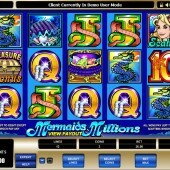 With a popular theme, juicy betting, and a maximum jackpot of $37,500, there's plenty to like about Mermaids Millions. It's good to see Microgaming have followed the two developers I mentioned at the top of the review and gone for some nice free spins, but I'll leave the final note for them: Microgaming - please do something about the apostrophe possession. Do the millions belong to the mermaid or what?